Let’s say you have finished your website and it looks great. You spent time thinking about the design and the layout. The colours. The fonts. Now you have an “attention-getting” website on the internet. Your new website probably hits the first page of Google really quickly because it has lots of new information that people are reading. Your first couple of months are really busy. But then everyone has seen the site and your page hits are dwindling every month. Maybe you pay for a Google Adwords campaign to try and get back to the level of attention you had when you launched. This might work, but the cost can build up. Before you spend money on Adwords or an SEO specialist, take some time to think about your content. Is it still current? Is it interesting to you? As a person in your industry, does it make sense? Does it grab your attention? You can get back to that initial level of traffic and keep people coming back to your site. A nice, pretty web site is great at first, but people will not come back if there is no new content for them. They will go somewhere else. You need to keep writing content. And simply changing some text on your existing pages is not enough. You need to write new, compelling content that people want to read. It needs to catch their attention and draw them in. And it needs to be current. I did this on my website by creating a news feed. It’s just a list of blog posts that I write every week relating to information going on in my industry or on the internet. You will be amazed how easy it is to find content to write about. But you need to keep writing, or get someone to do it for you. This is how you keep your website current and fresh, which will bolster your google search rankings and keep you on top of your competitors. Because if someone searches Google for a keyword phrase and your competitor appears before you, you may lose that potential customer. Here are some tips on how to write good content that will earn you great Google search results. Put your keyword phrase in your title. Google will only show the first 57 characters of your title so think carefully about it. If your content relates to “getting good mileage from your car tyres” but your title does not mention that phrase, then it’s going to negatively impact your click-through rate. Google tracks every click on search results. If your content gets clicked more than your competition, Google considers your content more relevant and moves it up the rankings. You want to attract attention and encourage people to click your search result. So think carefully about the text that you put in your title. The meta description is the smaller text that appears underneath the title and is a maximum of 156 characters. You should type that when you create your content. If you don’t enter a meta description, Google will just use the first 156 characters of your text – which may simply be introductory information and not contain your keywords. Your meta description should contain your keyword phrase and some explanation of why your content is the best source of information about that keyword phrase. Meta description is the text that appears underneath your title. It is key to capturing people's attention. Sometimes you cannot reduce your meta description down to 156 characters. So you should make use of the ellipsis to tease interest. Magazines have been doing this for years. It gets people reading and then cuts them off – but they want to finish that sentence so you have grabbed their attention. If you are going to use this approach, be sure that the words appearing before the ellipsis are catchy and enticing enough to make the reader want to click through to read more. Create a “tease” by using a truncated sentence and leave your reader hanging and wanting more. This will draw them into clicking your link and visiting your site. Include your target keyword phrase in your meta description. A combination of your key phrase in your title and meta description will solidify the relevance of your article. Google will reward this and it will also get people's attention. This is a simple one and WordPress can do this for you. You might have seen websites where the URL is just a series of letters and numbers to identify the page. This is a waste of prime SEO real estate. Instead, use WordPress’ permalink structure that puts your title in the URL, separated by hyphens. And you can customise this too. But make sure you use your keyword phrase. 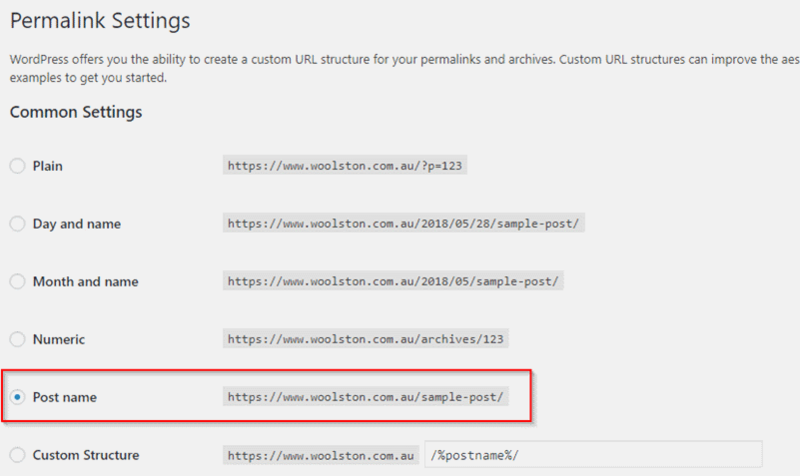 WordPress lets you configure the appearance of your links. They are called "Permalinks"
WordPress lets you customise your link at the page or post level too. When you are creating your content, you can click the Permalink section underneath the title and customise it. This is especially useful if you have a long title and want to shorten the permalink. You can easily remove "and" and "the" and replace with hyphens. 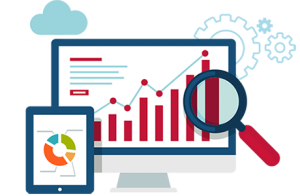 Gone are the days where keywords and tags were littered all over the page to attract search engine favour. That approach will now work against you. Google has quite strict rules about "cheating". If you try to "stuff" your page with keywords, the Google algorithm is smart enough to realise this and your page ranking will be negatively affected. So do not do it. Instead, try to use synonyms instead of repeating your keywords. If you are struggling to find alternative words for your keyword phrase, try using a web site like http://www.thesaurus.com/browse/search. Place your keywords at the beginning AND the end of your page content. This will give the reader an early understanding of what your article is about and will also reinforce your points while you are summing up your content. Keep your reader on the page until they read to the very bottom. You have taken the time to write your content so you really want the reader to see it all. Keeping your reader engaged is your priority. I mentioned earlier that Google tracks the clicks from search results to your page. There are also metrics called "time on page" which measures how long a person takes to return to the Google search results after clicking a link. If your "time on page" metric is low (people return to their search results quickly), this tells Google that your content is not relevant or compelling. This can result in Google not listing your page for your desired keyword phrase and you will lose your audience. You want to engage your readers to keep them on the page. Ideally, you want them to read the entire article so think of ways to keep their attention and keep them on your page. Some people like to start reading content as soon as they arrive on a page. Other people like to scan the headings on the page and decide if it’s worth their time to read. This is why it’s important to format your headings and subheadings so they are clearly different from the body text of your page. It also helps you write the content too. If you scaffold out your headings and subheadings, you can then fill in the content between. And you know which heading is coming next, so you can segue to it at the end of the previous section. Every page with content on your web site should have images. Images break up your content and stop a reader from getting "fatigued". An image or an infographic are great ways to allow the reader to pause slightly before continuing on. Be sure the image is relevant to the content though otherwise you could lose their attention. Give your images a file name that is descriptive of the image you upload. You know that Google indexes web sites and their content. That content includes images. Google collects your images and serves them up in a Google Image search. So if your image has a descriptive file name, it will be indexed using that text and will be easier to find. Google Image search has much less results than Google Web search so this means less competition for a reader's attention. If you are not capitalising on this market, then you are missing out on readers. Links to quality web sites will attract you good ranking points. But be sure it is a source that ranks high for it’s own keyword phrases. Also, use internal links in your content. A "internal link" is a link in one article that takes the reader to another article on your site. Not only does this keep the reader engaged, it also goes well towards your “average time on site” metric. I said earlier that Google measures how long a reader stays on your site before clicking back to the search results. Drawing a reader to click another link on your site takes them further into your site and keeps them engaged. When you use internal links, don’t just make the anchor text “click here for more details”. Actually use your keyword phrase in the anchor text. So if you are linking to an article about hair colour, the anchor text could be “click here to see how the right dye can make or break a good purple rinse”. So there you are - 7 easy ways to improve your Google page ranking without spending any money. These simple steps will help you become a better writer and will attract more interest in your web site. Please read through my other articles and news to see more useful information. If you want to get in touch, send me a message. I would like to hear from you.